Welcome to one of the most popular LiveBest recipes! 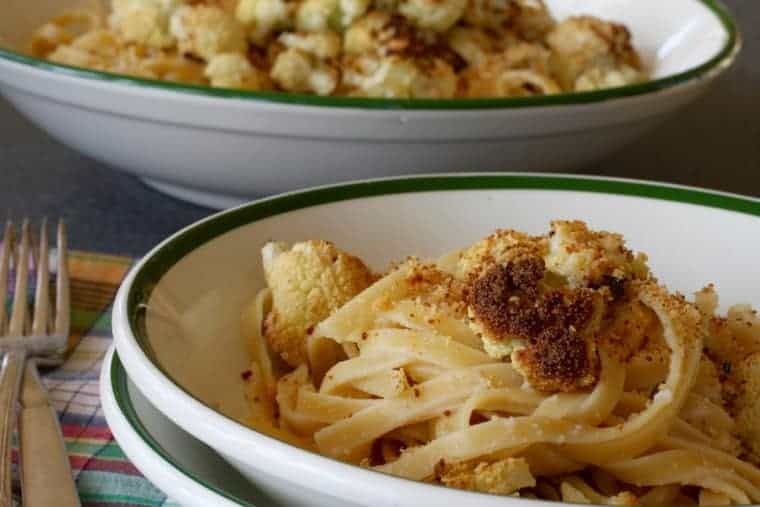 Roasted Cauliflower Fettuccine is a healthier version of alfredo – lower in calories but not flavor. Use stems for flavor and to reduce food waste, this is a stealth health recipe! I used my Vitamix blender to puree the cooked cauliflower, broth, and other ingredients, but as long as the cauliflower is cooked until soft, any blender should work. Be careful when adding hot liquids to the blender, the heat can cause the lid to pop off. If you vent the cap slightly, heat can escape. My recipe includes a sprinkling of toasted breadcrumbs. You might think they’re unnecessary, but I think the crunchiness enhance the dish. The compounds that make cauliflower a good-for-you veg, can also make it finicky. Overcook it, and the sulfur compounds are released so the sulfury smell hits high gear. Think Old Faithful. It took me years to make cauliflower soup after my first overcooked attempt left the house smelling like rotten eggs. Good thing I learned how to cook it the Goldilock’s Way…just right. It’s stealth health. Doubtful anyone will guess that the sauce is a vegetable puree. Because the stems are used in the sauce, there’s little food waste. The leftover sauce freezes well, so you have another meal standing by. Just add the sauce to another cooked vegetable or use as a base for creamy soup or macaroni and cheese. 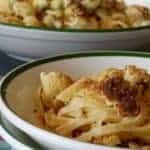 At the store, choose a cauliflower that is creamy white and compact. Avoid those with brown spots. The leaves (which are edible) should be crisp and green. Cauliflower should be kept tightly wrapped and can be refrigerated up to 5 days. Cauliflower provides fiber. Foods with fiber can help you improve your health so I created a free, 5-day challenge you can join by clicking this link. You’ll get tips and tools, resources and recipes to create your own roadmap to meet your fiber goals. Don’t ya? Won’t ya? Seriously, it’s only 5 days 😉 Find it right here. 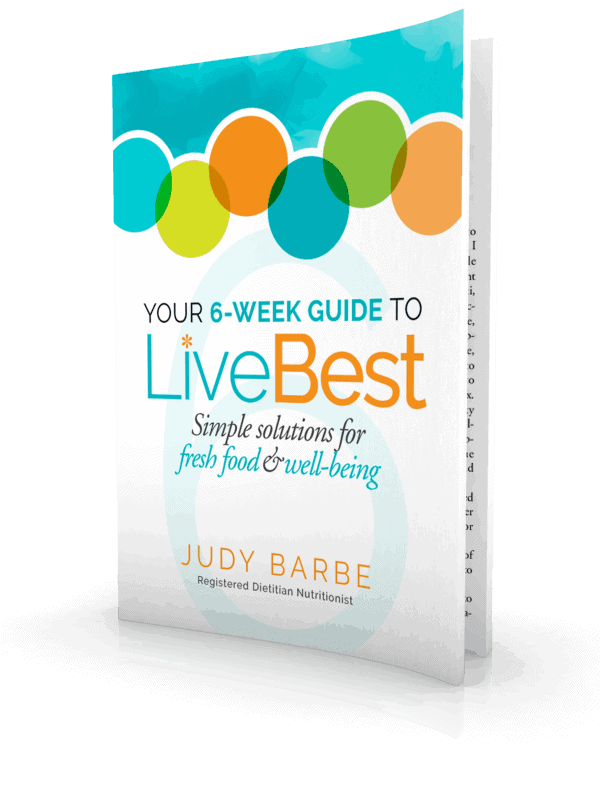 Welcome to one of the most popular recipes at LiveBest! 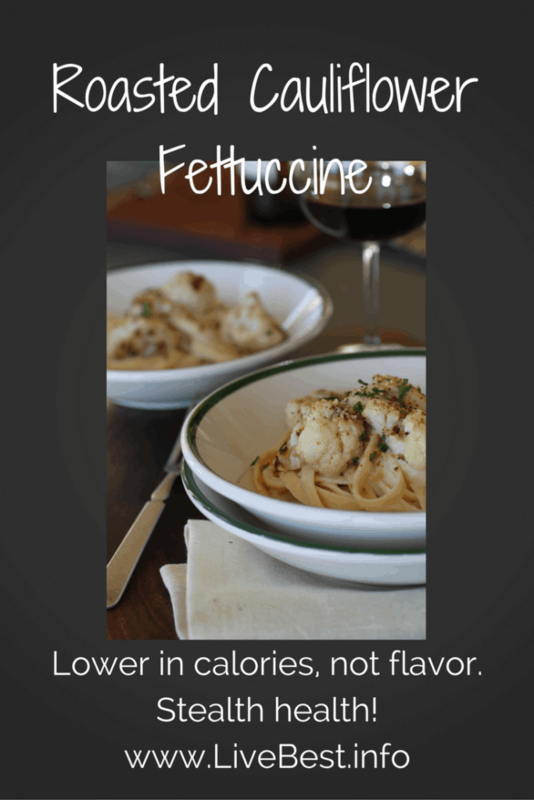 Roasted Cauliflower Fettuccine is lower in calories but not flavor. Use stems for flavor and to reduce food waste, this is a stealth health recipe! Heat oven and a large baking sheet to 400°F. Cut cauliflower in half. Cut out center core and rough chop into pieces. A uniform size is good but not necessary. Break or cut remaining cauliflower into bite-sized florets. In a large bowl, toss the cauliflower with olive oil to coat. 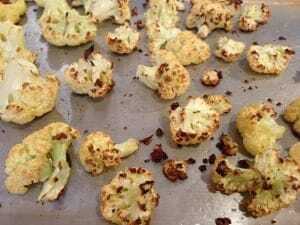 Carefully spread cauliflower on heated baking sheet. Spread the cauliflower out so pieces aren’t touching. Return to oven and roast 20-30 minutes, until soft and browned. Remove from oven and set aside. In the meantime, in a medium saucepan add cauliflower core, broth, garlic cloves, and crushed red pepper. Bring to a boil, cover, reduce heat to low and cook until tender, 15-20 minutes. Cook pasta according to package directions. Fettuccine takes about 12 minutes to cook. In a blender, combine cauliflower broth mixture, milk, flour, butter, Parmesan cheese. Blend for a few minutes until mixture is smooth. This can be made ahead and refrigerated. When ready to serve, heat cauliflower mixture and lemon zest over medium heat, stirring regularly until mixture just begins to boil gently. Stir for one minute. Reduce heat to low. 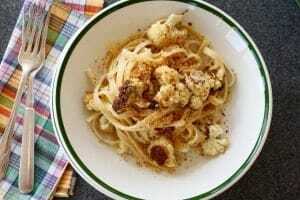 Combine roasted cauliflower and fettuccine in a large bowl. Stir in just enough sauce to coat the mixture. You will have sauce remaining. (You can freeze the remaining sauce in a tightly covered container). Sprinkle breadcrumbs and chopped parsley over top. To make Breadcrumbs: Use 2 slices of bread, any type and 1 teaspoon olive oil. Tear bread into pieces. Process in blender or food processor until coarse crumbs. Toss with a teaspoon of olive oil. Stir to coat. In a 300 degree oven, spread crumbs on a large baking sheet. Toast 5-8 minutes until lightly browned. Remove from oven and allow to cool. Breadcrumbs can be stored in the refrigerator in a tightly sealed container for several weeks. Freeze the remaining sauce in a tightly covered container. Thaw and add cooked vegetables for another round of pasta. my pasta bowls are no longer available, but a these are similar. A low-profile bowl keeps the sauce in! This post contains affiliate links. That means if you click through and make a purchase, the seller may pay me a commission. The does not affect the price you pay. How many calories is in one serving?